Your loved one’s touch captured forever. It’s so true to life you’ll think she just removed her finger from the metal. Don’t settle for less than Dimples High Definition technology to create a treasure you’ll cherish for a lifetime. 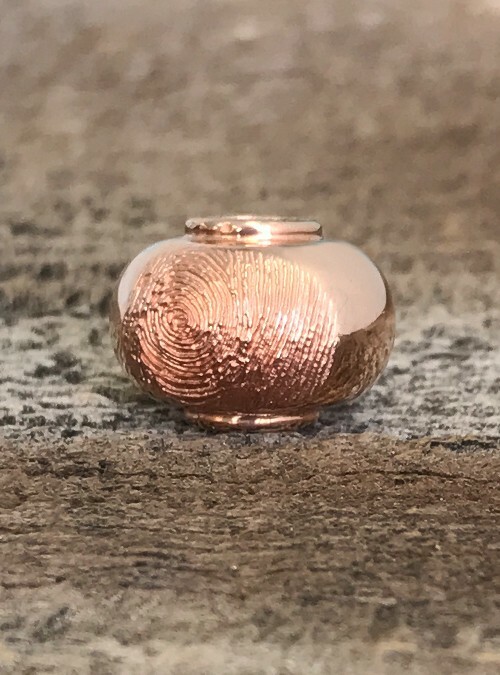 Your loved one’s fingerprint in high def on a rose gold bead that fits on Pandora and all other major brands of slide on bracelet. Can be worn on a chain too. Fits on all standard brands of slide on bracelet (including Pandora). Engraving on the back is included. 1 Character limit.